But as dangerous as Wilson’s vision may be, Dark Wallet also fills a real need for privacy in the bitcoin economy. Despite its reputation as an anonymous currency, bitcoin transactions are in some ways nakedly public–even more so than those made with traditional money. Every bitcoin payment is recorded in the public ledger known as the blockchain, copied to thousands of users’ computers and checked to prevent forgery and fraud in the Bitcoin network. If bitcoiners don’t take special pains to anonymize their coins, all of their spending can potentially be traced back to their bitcoin addresses by any corporation or government agency that cares to look. 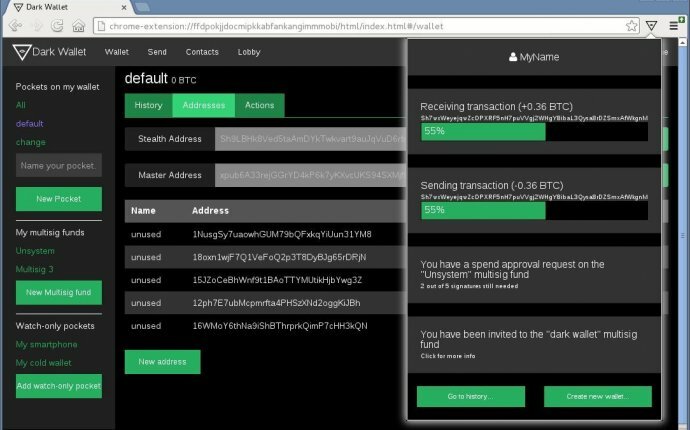 Dark Wallet avoids those privacy and trust problems by integrating laundering by default into every payment its users make. Its central tool is a technique called CoinJoin: Every time a user spends bitcoins, his or her transaction is combined with that of another user chosen at random who’s making a payment around the same time. If, say, Alice is buying alpaca socks from an online sock seller and Bob is buying LSD on the Silk Road, Dark Wallet will combine their transactions so that the blockchain records only a single movement of funds. The bitcoins simultaneously leave Alice’s and Bob’s addresses and are paid to the sock seller and the Silk Road. The negotiation of that multi-party transaction is encrypted, so no eavesdropper on the network can easily determine whose coins went where. To mix their coins further, users can also run CoinJoin on their bitcoins when they’re not making a real payment, instead sending them to another address they own.